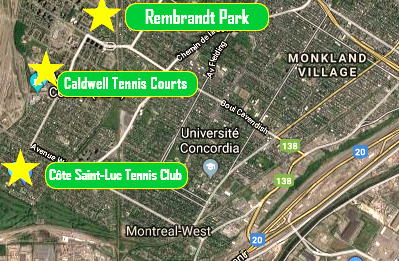 1) Caldwell Tennis Courts: 5785 Parkhaven Cote Saint-Luc, Quebec H4W 1X8. Click here for more information about the courts. 2) Côte Saint-Luc Tennis Club: 8215 Guelph Côte Saint-Luc, Quebec H4W1J1: Read more about the club the Côte Saint-Luc Tennis Club by clicking here or download the registration form by clicking the image For French registration form click here. The phone number of the club is 514-487-7862. Click here for more information about the club. 3) Rembrandt Park: The corner of Rembrandt Avenue with Kildare Road and Merrimac Road in Cote Saint-Luc, Quebec. Phone number is 514-485-6959, and for rentals dial 514-485-8912.